“I have rarely been bored because I always have a project or two just waiting for me to find time to enjoy. Sewing has been my favorite hobby, and I have spent countless hours at the sewing machine. When the girls were growing up I made nearly all of their clothes and was my happiest when I had a new piece of fabric and a new pattern. In fact, I acquired so much fabric there was no place to keep it all. 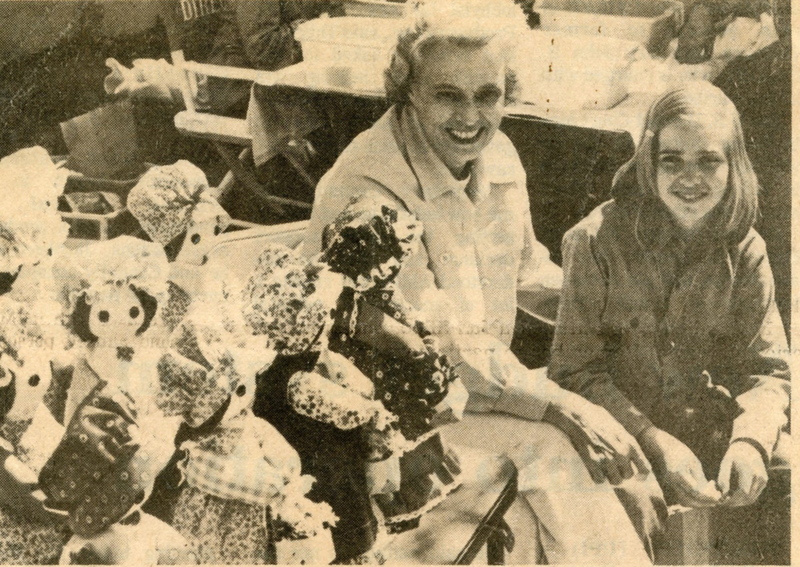 “My love for sewing and pretty fabrics paid off in 1975 when I decided to make bottle dolls and sell them. I had read an article in Decorating and Crafts magazine describing how to make a doll using a throw-away drink bottle. I tried making one and thought it was so cute I would make a few and give them for gifts. After I had made about eight or ten, using different fabrics, and showed them to friends, everyone bragged on them and said they thought I might be able to sell them. “So I got busy and started turning them out and in April when the Carrollton Pilgrimage was held I decided I would take some of them over to see if they would sell at the crafts show on the Court House lawn. I decided I would ask $10 for each of them, to which Russell said, ‘You’ll never get $10, maybe $5.’ He agreed to go with me, however, to help me set up a table and see what I could do. 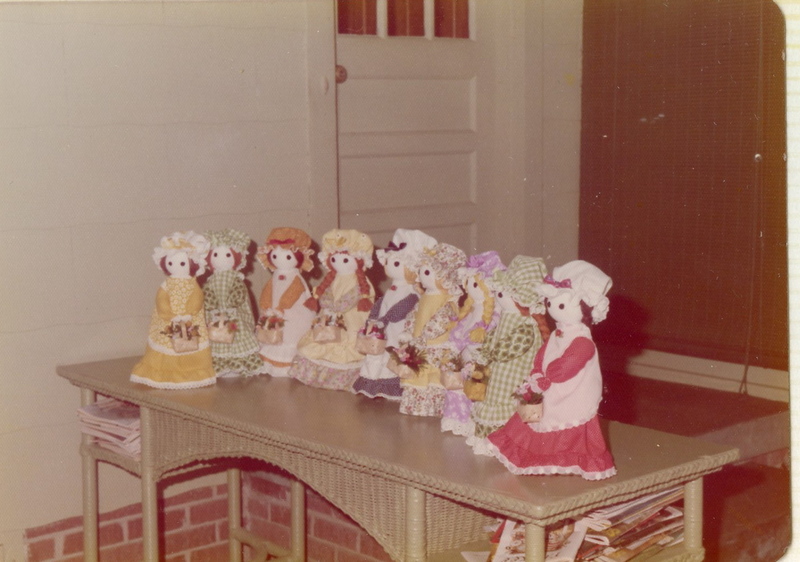 I went back on Sunday afternoon and in the two days sold fifteen dolls for $150, and thus started the doll venture which lasted nearly eight years. For those of you who don’t know all of Sara’s story, you’ve now entered one of her most fulfilling periods. By 1975, Cathy was married and living in Birmingham, I was starting medical school and in a Jackson apartment, and Sara’s newspaper career was simply not enough to keep her boundless energy contained. She had always gleaned ideas from craft magazines, turning odds and ends into the most amazing creations, but this particular idea truly struck a chord. When she put together the first little doll, we all patted her on the back and said something like “Really cute. What’s for supper?” She was used to our indifference to her talents, so she forged ahead and gradually turned 409 East Adams into a bottle doll factory. Each one required a glass Coke bottle, and has her early flea market successes began to pile up, family, neighbors and friends were increasingly challenged to consume enough carbonated beverages to keep her supplied. You’ll see over the next few days that this hobby turned into a money-making machine, but it wasn’t the cash that kept Sara going (although she certainly enjoyed that aspect of it). 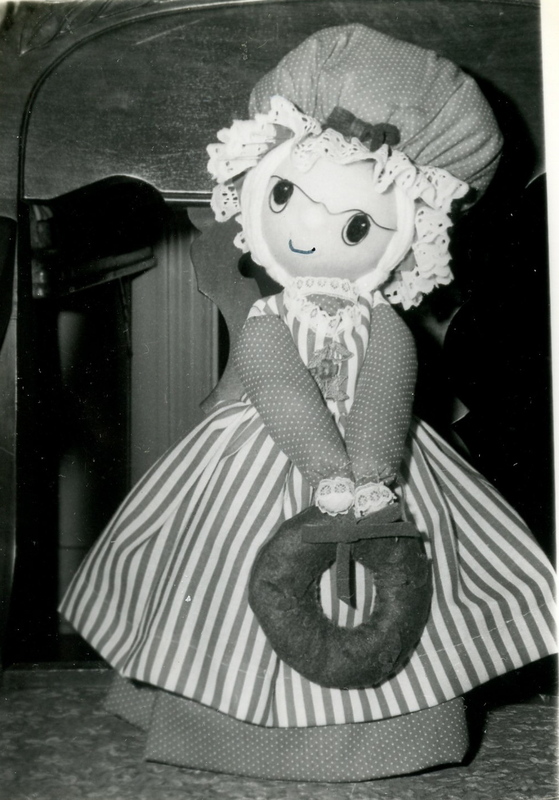 With Russell’s help and (usually) whole-hearted support, she invented a brand-new career as the Doll Lady of Mississippi. And you wonder why I often feel like a worthless good-for-nothing if I have a non-productive day? She’s a hard act to follow, even after all these years.